This may be a great year to see summertime meteors. Meteors, sometimes called shooting stars, are debris from comets and asteroids that become visible as they enter Earth’s atmosphere. Around August 12 and 13, Earth crosses the path of periodic Comet 109P/ Swift-Tuttle, which orbits the Sun every 133 years. Debris from this comet is widely dispersed along its entire orbit, and when Earth meets this debris stream, we see the Perseid meteor shower, which is active from late-July through mid-August each year. Perseid meteors can vary in size from 30 micrometers, or less, to small boulders, but most visible meteors are the size of sand grains, 1/16 mm to 2 mm wide. That’s only about 2 to 80 one-thousandths of an inch in width. Though mostly tiny, these comet particles enter our atmosphere at a relative speed of 37 miles per second; that’s about 130,000 miles per hour. At such high speeds, the particles are heated rapidly to incandescence, and they can also cause nearby air molecules to glow. Meteors typically become visible at heights of 45 to 70 miles. Especially large and bright meteors sometimes result in visible debris clouds, called meteor trains. It’s easy to observe meteors. No special equipment is needed. Find a comfortable reclining chair and a dark site. Then, look high in the sky, especially after 11 p.m. on August 12, when the radiant in constellation Perseus, the apparent origin point of the Perseid meteors, rises in the northeast. The Moon is new on August 11, so it won’t interfere with seeing Perseid meteors at all this year. As Earth rotates, we race toward the comet debris head-on during the early morning hours, so meteor rates are typically highest during that time. That’s also when convective clouds tend to dissipate. If conditions are clear, we may be able to see as many as 100 meteors per hour before the onset of morning twilight on August 13. But if it’s cloudy on August 12 and 13, don’t worry. 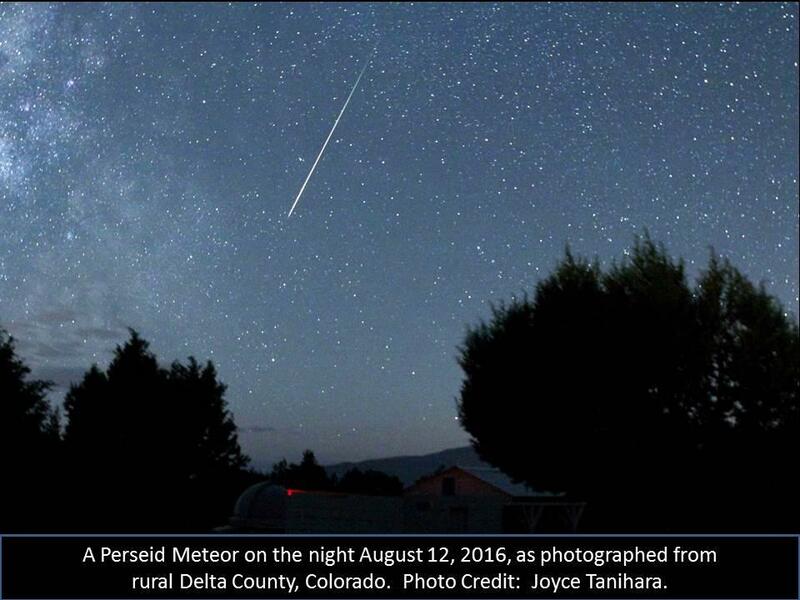 Many Perseid meteors can be seen both before and after the peak, but usually at rates below 100 per hour.